Any time I am invited to speak anywhere, I always lobby for a robust amount of time for a Q&A. It’s my favourite. The content that I share in my talks is designed to be attuned, excellent, full of heart, thoughtful, and inspiring (naturally). It’s designed to offer value long after the mic and lights are turned off and we’ve all left the building. But I can’t help but wonder: Did everyone get what they wanted? Did everyone get what they needed? Q&A time scratches that itch for me. An audience question means that I’m helping to solve an immediate concern or issue which feels fabulously, instantaneously useful. On-demand information and perspective. 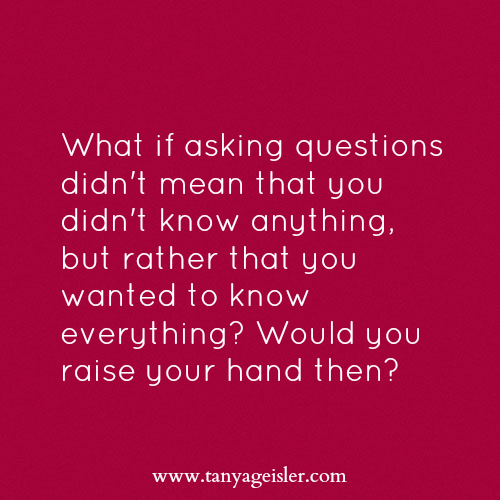 But here’s what I’ve been noticing the last couple of times I’ve spoken SPECIFICALLY to groups of professional women: (1) how tentative they are about raising their hands and (2) how long the queue is to ask me questions in private. Because the questions that I get asked are FABULOUS. They are sharp, clever, and help me to see new perspectives about my OWN content. They illuminate and clarify something for the asker and most assuredly offer value to anyone within earshot. So why do we keep our hands down? Why do we demure? Why are we so terrified to be found out that we don’t know something? If you’ve been here a while, then you already know my answer: the Impostor Complex. So we keep the shame hidden and we stay down. We stay quiet. And we stay a little less informed. A LOT less informed. "...she asks a lot of questions and should really try to be more independent and figure things out on her own." Yes. Because white-knuckled problem-solving is the only path towards innovation, right? Asking questions is a one-way ticket to living your adult life on your parents’ couch, right? As an ardent question-asker and someone who has never been afraid of being the dumbest person in the room, you can bet I had some questions for her teacher. In our (quite respectful) interview, I was assured that my daughter does indeed ask a LOT of questions about things she isn’t clear about. "Great," I said. "Asking just one question and walking away with any uncertainty? Now THAT would be lazy." I proceeded to thank the teacher for creating an environment that felt safe enough for my daughter to reach out for help and clarification as needed, so that she WOULD have the confidence to swing out and try things out for herself. Curiosity may have killed the cat, but then again... that’s why it was divinely gifted with nine lives. I vote you raise your hand.